Le rendez-vous est fixé la veille pour le lendemain, en fonction des conditions météorologiques. Pour le premier jour du stage, nous envoyons un message la veille au soir. Chaque séance de cours à une durée de 3h30 heures, sauf les formules spécifiques (cours particuliers, raid). Lorsque le cours n’est pas complet (1 ou 2 personnes seulement, le temps de séance totale peut-être diminué de 1h30, car il y a moins de mise en place). Sont compris dans une séance : l’accueil, la prise de licence, l’habillage et le déshabillage du stagiaire, le choix du matériel, la préparation et le rangement du matériel, le déplacement sur site. Une séance comprend un briefing, un débriefing collectif et/ou individuel, un temps de pratique. Le Spot Kitecenter a été créé par Ariane Imbert en 2008. Elle décida de créé son école sur Hyères, pour la beauté de ses sites, ses statistiques de vent, et pour la diversité de ses spots. L'ensemble des moniteurs est une équipe de professionnels reconnus depuis de nombreuses années et tous sont diplomés d'état. Le Spot Kitecenter se distingue aussi par son centre d’entrainement créé aussi par Ariane Imbert, entraineur national en kitesurf depuis 2012. Vous pourrez apprendre le foil, ou même faire des coachings freestyle ! Du débutant au Champion du monde, LE SPOT KITECENTER répondra à toutes vos demandes !! Matériel haut de gamme, de l’année. Nous sélectionnons les meilleurs produits afin de faciliter votre apprentissage. North Kiteboarding nous fait confiance, et a sélectionné notre école pour représenter à 100%. Les systèmes de sécurité sont fiables et aux normes françaises et internationales. 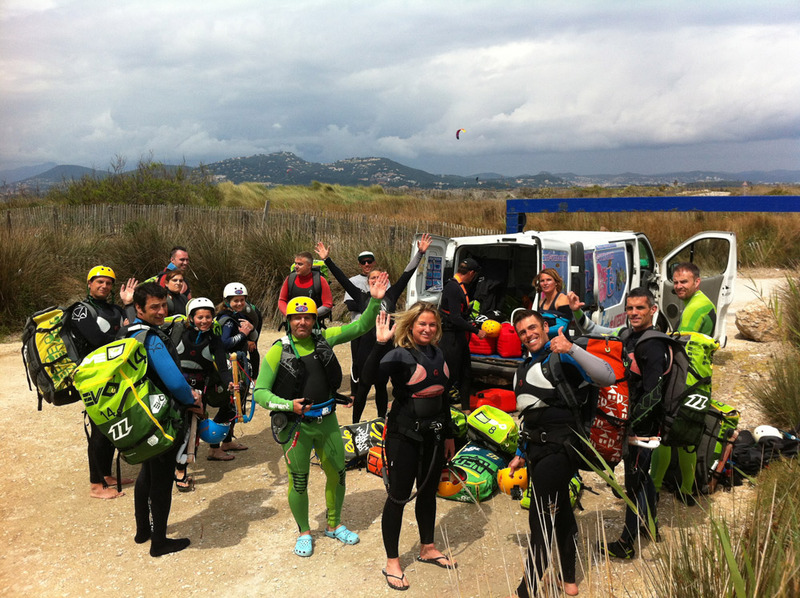 Notre école de kitesurf, le Spot Kitecenter, est située à Hyères dans le département du Var (83) au milieu de la presq'île de Giens à l’Almanarre. Reconnu pour ses conditions météo idylliques, notre centre sportif dispense 90% des cours de kite et stages en off-shore en toute sécurité pour bénéficier d'un plan d'eau plat favorisant ainsi votre apprentissage. Thumbs up for atmosphere, coaches and spot. Going out with the boat gives you the flexibility and space you need especially as a beginner when the last thing you need is to worry about 50 other kiters crossing. Not to mention the nice views on Porquerolles! Thank you, i hope to come back soon! Ciao, mi sono divertito un sacco, in tre giorni sono riuscito a "cavarmela" sul kite!! Questo perche' ho avuto il miglior istruttore che si chiama ADRIAN.. ho dato quattro perche' l' ultimo giorno volevano affidarmi ad un nuovo istruttore ... pure la mia ragazza era molto affezionata a lui!!! (Anche se non ha fatto il corso). Ps: senza vento mi hanno fatto fare wake che mi e' servito per imparare a partire con il kite.. Pps: gli istruttori parlano un ottimo inglese, Adrian meglio di tutti Ppps: alla reception ce Claire che parla un perfetto italiano ed e' molto simpatica Pppppppps: grande Adrian!!!!!! Super!!!! Lovely experience. Very nice teacher, with a good level of English. Loved it. I had really an amazing experience with this kitesurfing school. Professional crew from the beginning when I had to contact them to arrange my booking to the end. They use brand new equipement (North 2018). I enjoyed my experience with the coach I had (Adrien), he was really patient, professional and reassuring. Security was a major concern for them so as beginner you would be in good hands. I will definitely come back! I did no training at this school, but I saw the coach of this school kitesurfing near the beach. He got in trouble with another kitesurfer.... but there was no accident or something. After that he put his kite on the beach and ran to the other kitesurfer in the water and attacked him.... his kite crashed down on the beach in the wood fence.!!. ... I never saw before such an agressive and unfair sportsman... I think it was even the owner of the kiteschool.... shame on you! I used this school and can highly recommend them. All the equipment is new or in good condition, they have plenty of it and you will also have your own equipment (no sharing a kite). They obvious speak French, but also have English speaking instructors as well. Hyeres is also a good place to learn. It's in a bay on the sea so you get used to choppy water but without the waves breaking making the learning of water starts even more difficult. The school has boats for the lesson, so if the wind is onshore then they will start you out in the ocean and you will gradually arrive at the beach near the end of the lesson. If the wind is offshore, you start on the beach and work your way out to sea and they pick you up at the end in the boat. Obviously they are monitoring you and coaching during the lesson, not just leaving you as fish bait. This method maximises your time trying to learn because you don't have to walk up and down the beach to restart and you don't have to worry about all the other kite surfers, they will be well out of your way. 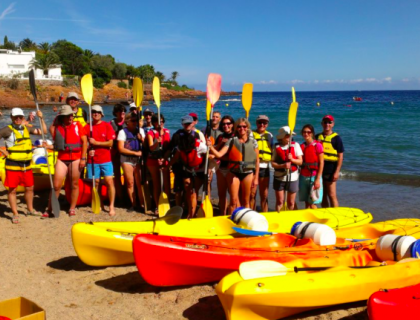 If you want to learn kind boarding and fancy doing it whilst combining a holiday, consider hyeres and definitely check out this school for lessons. SportRIZER contacte LE SPOT KITECENTER et vous propose rapidement la meilleure offre.